Plant species, being immobile organisms and yet having the ability to expand their distribution in such challenging habitats, harbor a great potential for studying mechanisms that lead to trait evolution and to functional and phylogenetic diversity. My main research aim is to shed light to the evolutionary processes behind this naturally occurring variation by studying the genetic basis of adaptations in natural environments. For this purpose, I conduct comparative studies both within and between species by integrating experimental, physiological and next-generation sequencing techniques in an ecological and evolutionary genomics context. Understanding how environmental changes affect genes and traits will fill gaps in the evolutionary theory while helping us to make better predictions on organisms’ responses to our changing world. My research focuses mainly on the plant adaptations evolved as a response to abiotic stresses related to drought, submergence and temperature changes. 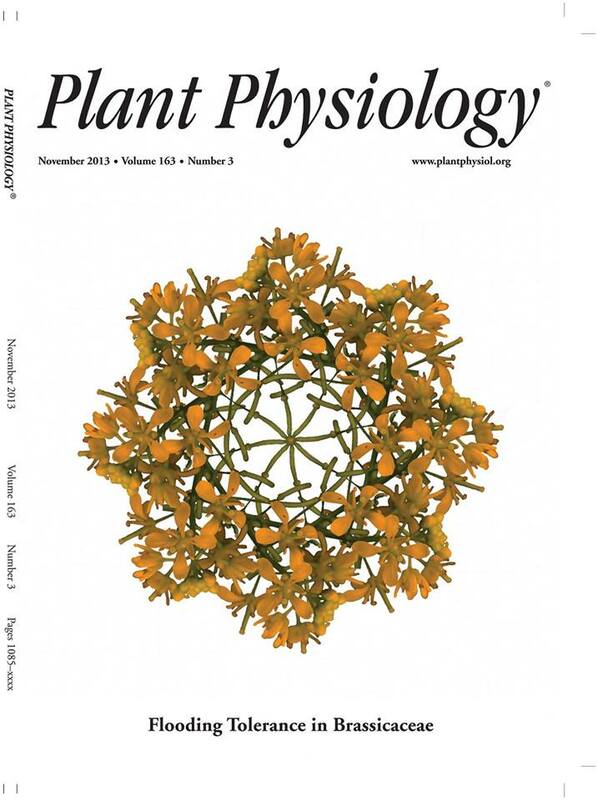 In addition to my Rorippa work, I explored submergence tolerance in naturally occurring accessions of Arabidopsis thaliana, which led to the discovery of a submergence tolerance quantitative trait locus that harbors many genes potentially important for submergence sensing and survival (manuscript ready and soon to be submitted). Complementary to this work, in a collaborative project with the Ecophysiology group in University of Utrecht, we studied gene regulation responses of eight Arabidopsis thaliana accessions under submergence by using next generation sequencing of transcriptomes. In this work, we identified genes and gene pathways that show differential regulatory patterns in tolerant and intolerant accessions (manuscript in preparation). With the recent advances in sequencing technologies we are now able to take up the challenge of discovering genetic basis of trait evolution not only in model organisms but also in other ecologically important species. Accordingly, the current project I am working on, funded by National Science Foundation within the framework of Dimensions of Biodiversity Program, is focused on a South African shrub species, Protea repens (sugar bush), expanding a wide range of climate gradients in the highly diverse Cape Floristic Region. Functional trait variation that different populations display, across strong gradients in precipitation, temperature, fire frequency, make this species a great system for exploring evolutionary mechanisms leading to local adaptation. In this project, I am using three complementary approaches. First, I have analyzed population level gene expression patterns that correlate with environmental variation and how these relationships are reflected in trait expression. Second, by using experimental physiology and transcriptomics, I am studying responses of different populations to important environmental stresses. And lastly, by using population genomics approaches, I will try to reveal signatures of natural selection acting on gene sequence variation by using population level genotype and trait data. Phenotypic variation can be shaped either by gene sequence diversity or plasticity in expression patterns, or a combination of both. Recently, there have been many studies looking at population level sequence variation to detect signatures of natural selection, however gene expression variation is often not explored. This is mainly because gene expression is a readily changing and plastic process influenced by many external factors, which makes sample collection challenging. Nevertheless, common garden experiments enable us to minimize this excess variation and to detect biologically relevant responses of plants to various environments. For this purpose, we set up a common garden consisting of seedlings from Protea repens populations in order to study correlations between trait phenotypes, source population site climate variables and gene expression patterns of the seedlings. By analyzing common garden transcriptome-wide expression data, I identified gene networks correlated with temperature-related environmental variables of the source populations. The expression patterns of the same gene networks, which are involved in growth, cell wall and carbohydrate metabolism, correlates also with growth related traits. This study shows that, environmental variables of source sites are explanatory factors for gene and trait expression variation in a common garden, indicative of local adaptations in sugar bush. Stay tuned for this paper! Another line of my research is to conduct experimental physiology and transcriptomics studies to detect genes that are differentially regulated between populations when plants are under drought and temperature stress. Accordingly, in a collaborative project with Dr. Jane Carlson of Nicholls State University, we are performing stress experiments in a green house for select populations of Protea repens. Our aim with this work is to complement the results from our population level transcriptomics project by detecting differential gene regulation patterns of these populations to strong, well-controlled environmental contrasts. We will be testing if similar genes or gene pathways, as detected in our common garden experiments, are regulated in different populations under drought and temperature stress and if we can detect population specific responses shaped by source site climates. Apart from the gene expression variation, I am also interested in how the evolutionary processes shape gene sequence variation and allele frequencies in distinct populations. For this part of the project, I am analyzing sequence data from twenty Protea repens populations across the environmental and geographic range of the species in order to detect outlier loci as an indicative of selection. Additionally, by using genotype and the trait data, I will conduct a genome wide association study to find loci controlling functional trait variation observed in the common garden. Both of these analyses will complement to the population level transcriptome and experimental physiology projects to reveal genetic basis of local adaptations in Protea repens, which can later be translated to other species adapted to Mediterranean climates. Rapid adaptations have been observed in many invasive plants, which enable them to quickly expand wide climatic and geographical ranges. Thus, they are excellent models for studying genetic basis of local adaptations. Ice plant, Carpobrotus edulis, originating from South Africa, had been introduced to other Mediterranean regions in the last century as ground cover to stabilize dunes in the coastal areas. It is now considered as a problematic invasive species in California, and is thought to cause a threat to several state-listed endangered plant species in dune habitats. 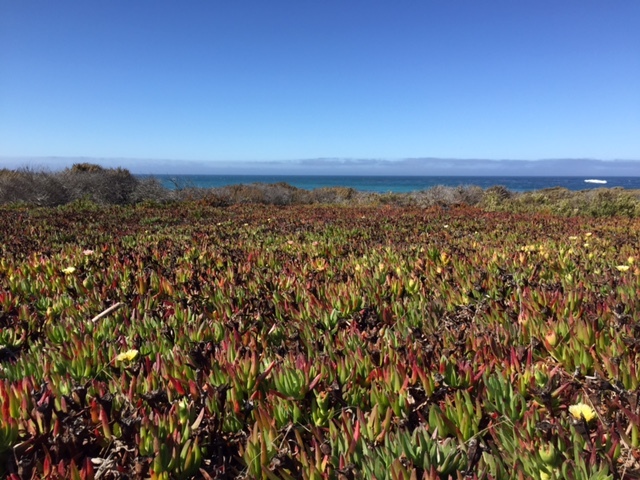 In a recent project, with my MSc student Xinyi Zhao, we are looking at population differentiation of 2 ice plant species (C. edulis and the less invasive C. chilensis) in 10 populations along California coast to first test if the populations of C. edulis indeed show differentiation and second to reveal species differences and hybridization patterns that might contribute to the more invasive nature of C. edulis. This will be achieved by setting up two common gardens in UC Reserves with the six populations of each species. We will be exploring the functional trait and gene expression variation among these six populations in an attempt to link the local environments to adaptions in these two species. Additionally, another ambition of mine is to conduct comparative studies with the South African, Mediterranean (mainly Turkish) and Californian ice plants to reveal continental patterns of adaptations. In order to achieve this, my goal is to start collaborative projects involving researchers from Turkey, California and South Africa to make use of similar climate histories and possible collaborative opportunities. 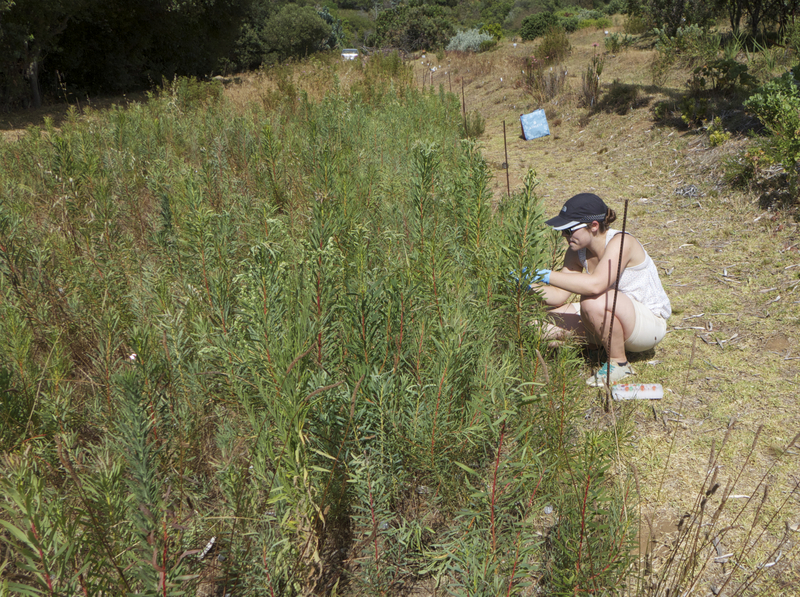 This study will reveal the nature of strong environmental selection pressures that shape plant communities in these Mediterranean climates present in three continental locations and aid us to understand the genetic basis of invasiveness.